It is a world transformed. Where things are not as they seem. 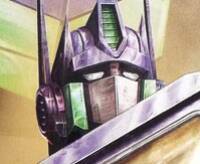 It is a world of the Transformers...A world of the Heroic Autobots and Evil Decepticons! The Commander in Chief of the Cybertron’s feels obliged to protect all living beings against the threat of the Destron army. Convoy was revived on Earth by Teletran 1 with the ability to transform into an earthen tractor trailer. A great strategist with enduring courage he fights against the evil of the Destrons; his presence is a symbol of the Cybertron’s fight for freedom and justice.